New digs, new grub. Kane recommends five restaurants near our new space in the Manhattan neighborhood of Chelsea. We even mapped it out for you. Now go eat! With more than 150 whiskeys on deck, there’s plenty of patriotic spirit to go around at this midtown bar and eatery — not to mention scores of small batch distilleries from around the globe. Kane says: Try the duck sliders and do a whiskey flight – and make sure to include Never Sweat bourbon among your selections. Rumor has it that the owner might even pull out the Pappy Van Winkle from the basement for his most loyal customers. 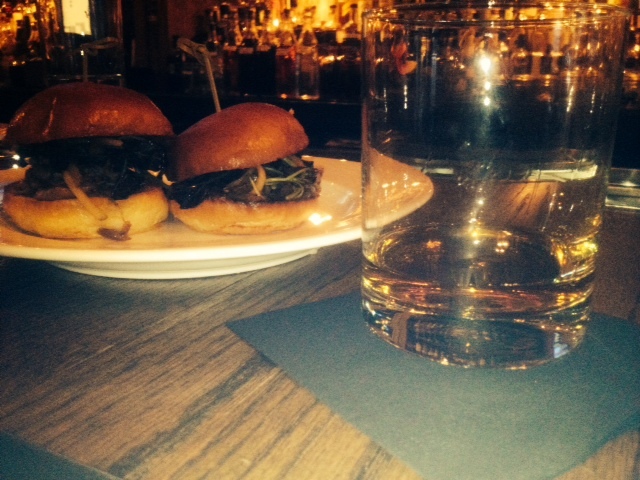 Sazarac Rye from Kentucky, paired with the duck confit sliders with fois gras butter. Apparently, The Rolling Stones (yes, the band) provided the branding concept for the dining experience at NoMad. When you see what this lavish joint is plating up, your mouths will drop like the “tongue and lips” logo on the Sticky Fingers album. Kane says: Go if you’re looking for the epitome of the high-end extravagance for which New York’s restaurant scene is internationally known. The Breslin was a pioneer of Gotham’s British (gastropub) invasion that took place a few years back. Today, it remains a favorite by critics and food enthusiasts alike. Kane says: Indulge in the boisterous atmosphere and try the famous lamb burger, a solid standby as you sift through the kitchen’s extensive menu. A NYC stronghold since ’87, this contemporary, family-owned restaurant mixes traditional Korean fare with more modern takes on East Asian cuisine. Kane says: With a chef who is well respected in New York’s culinary circles, Hanjoo is one of the city’s best kept secrets. Try the Bibimbap. family-owned gem a Chelsea institution is their house-cured meats and homemade link sausages – the latter of which is sourced to restaurants across the country as well as served fresh daily at Biricchino. Kane says: The regular menu isn’t worth the time to read: it’s all about the sausages here. The wild boar with red wine sausage is fabulous.